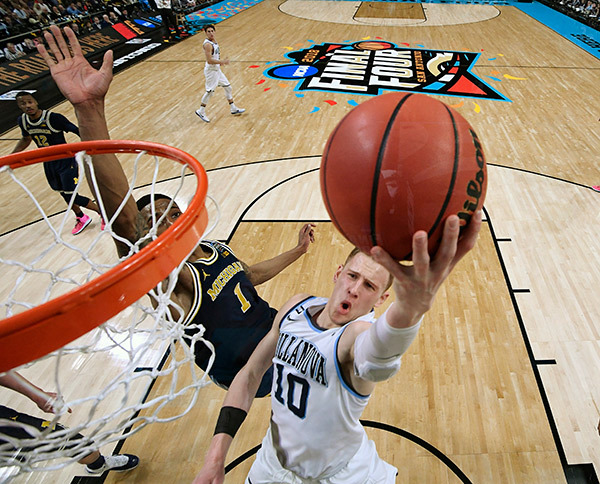 Villanova's Donte DiVincenzo (10) goes up for a shot during the championship game of the NCAA college basketball tournament, Monday, April 2, 2018, in San Antonio. How tall is Donte DiVincenzo? Where is Donte DiVincenzo from? He is from Wilmington, Delaware. What year is Donte DiVincenzo? How old is Donte DiVincenzo? Where did Donte DiVincenzo go to high school? Villanova fans celebrate after the Wildcats win their second National CHampionship in three years. Villanova players at San Antonio River Walk parade. Alicia Vitarelli reports during Action News Mornings on April 3, 2018.